Tom Cruise, once again a shadow of his former self, plays Tom Cruise, playing Jack Harper, one of only a few humans living on earth after a monumental battle with aliens in the past. Now Earth is a dead planet with its last morsels of energy being sucked out of the water supply by giant ocean turbines. Harper’s job is like a glorified security guard ‘cruising’ around the area making sure everything runs smoothly. His partner is the luscious Andrea Riseborough decked out in matchy-matchy grey and white, perfectly coiffed amber hair and high heels despite the fact she never leaves her Cloud City-like superpad. Harper’s threats include alien remnants hiding out in the ground like guerrilla warriors looking to terrorize what’s left on earth. We never really see these creatures except for their silhouettes hidden under darkness and covered up by fluffy costume design. Some twists later on will reveal them as something more significant than alien terrorists. In fact Harper’s whole scope of existence will change throughout the film when he comes to realize he’s playing for the wrong team, and his enemies are his friends and his friends, enemies. There’s much in common with the lacklustre but still wholly entertaining Tron Legacy. 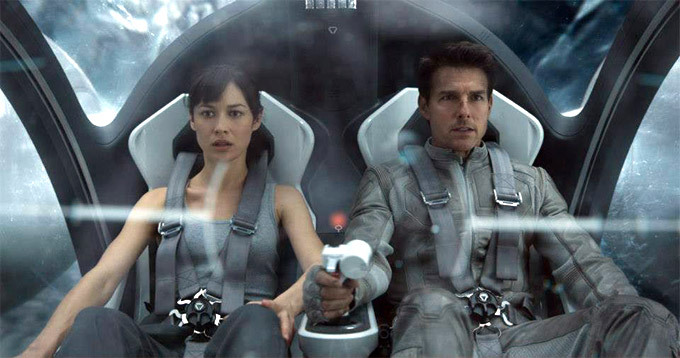 Oblivion’s attempts to inject existential themes of humanity and transcendental nature love but with same kind of sledge hammer like subtlety of Tron’s rudimentary and heavy-borrowed father-son melodrama. At every plot turn we can’t help but see Kosinski’s inspirations as clear as day and without any of his own authorship which turns theft into homage. There’s theme of control and subservience of The Matrix, the cloning of Moon, the omniscient faceless enemy of 2001: A Space Odyssey, even the likeness of Robocop’s ED 209 is visible in Kosinski’s drone robots. Daft Punk’s giddy electro dance score seemed pitch perfect to the retro nostalgia of Tron Legacy, here in Oblivion it simply feels like thievery of Hans Zimmer’s Dark Knight score. And the bone white and gun metal grey colour scheme, Apple product line art direction and the pristine and controlled compositions have almost no ‘Wow’ factor as they feel shamelessly xeroxed from films going back to various music videos of the 1990’s and back 20+ years further THX 1138 (a film which, in hindsight, seems miles ahead of its time). Sadly even for movie fans looking to disengage themselves from their brains and enjoy some good action and eye candy will be disappointed.